Azodicarbonamide is a yellow orangish powder, more commonly used commercially in the creation of foamed plastics – like yoga mats, shoe soles, floor mats and window gaskets. 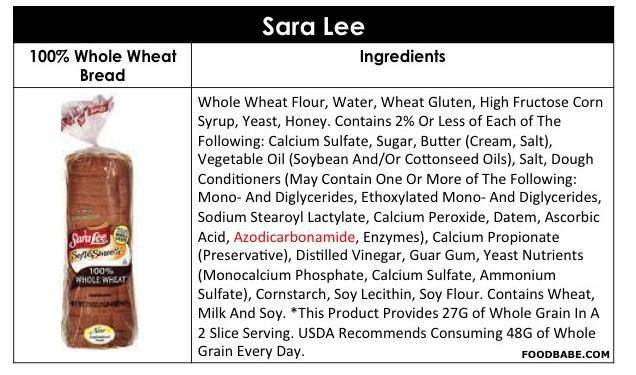 The FDA allows food companies to use azodicarbonamide as a flour bleaching agent and dough conditioner in any food product giving it a status of GRAS or “Generally Regarded As Safe”. But, the FDA doesn’t even keep track of the companies who use azodicarbonamide as an ingredient. The lack of information leads the FDA to not update or include an toxicity information about this ingredient in its EAFUS or “Everything Added to Food in the United States” database. The U.K. has recognized azodicarbonamide as a potential cause of asthma if inhaled, and advises against its use in people who have sensitivity to food dye allergies and other common allergies in food, because it can exacerbate the symptoms. The World Health Organization (WHO) studied azodicarbonamide, and also linked it to asthma and other allergic reactions. When azodicarbonamide partially degrades with the heat of processing, it forms trace amounts of semicarbazide, which shows carcinogenicity that can result in tumors over time. 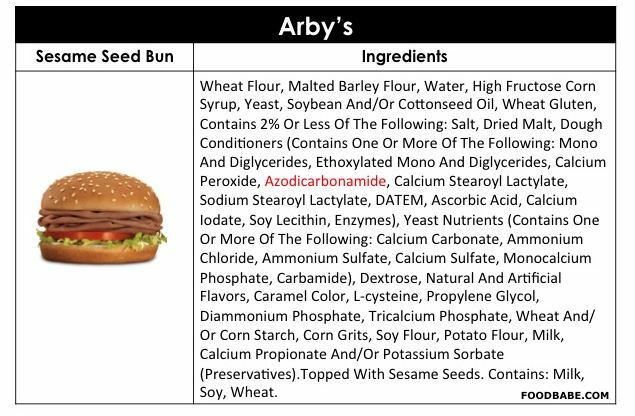 The United States is one of the only countries in the world that still allows this ingredient in our food supply. It is banned as a food additive in the U.K., Europe, and Australia, and if you get caught using it in Singapore you can get up to 15 years in prison and be fined $450,000. I’d like to see the head of the FDA put in jail for allowing it, wouldn’t you? Why The Heck Are Companies Using This Ingredient? Dough conditioners allow companies to pass off chemically processed cheap food as “freshly baked” because it recreates perfect, evenly packed air pockets within the dough, improving the texture after coming out of large industrial machines from processing. If a company uses azodicarbonamide as a flour bleaching agent it speeds up the processing, making bread larger and whiter than normal. Faster processing with cheaper ingredients = more money in Big Food pockets. Remember to buy organic bakery goods that prohibit the use of highly questionable chemical ingredients like azodicarbonamide and other dough conditioners. 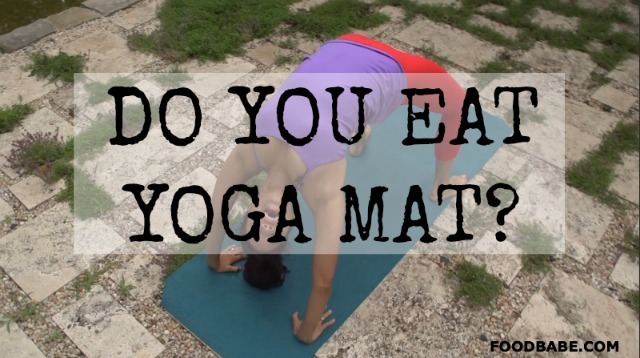 Please spread the word and share this video with everyone you know… no one should be eating yoga mats, their shoe sole or a floor mat. Yuck.